What Does Victory Look Like in Afghanistan? More U.S. troops are likely headed back to Afghanistan soon, while the Trump Administration is also now considering withdrawal. Before either option––or anything in between––is considered, the U.S. needs to decide what version of victory it wants before it can decide on a strategy. One of the most shocking statements I’ve heard on Afghanistan in sometime was that the official U.S. policy is to force the Taliban into a negotiated settlement. This statement came from a highly respected scholar of U.S. foreign policy and military strategy. I wondered what veterans like myself should think of such a policy. Almost 17 years of fighting, over 2,000 killed, and countless others wounded or otherwise affected, and our strategy is now to accept peace with the Taliban and see them holding legislative seats in Kabul and contributing to governing Afghanistan? To be fair, the statement above was somewhat of a misstatement. What he intended to say was that this is the actual policy being pursued by the U.S., if unofficially and inconsistently. It is an unofficial policy because it would be highly unpopular with the domestic audience in the U.S., and it is inconsistent because presidents have been unwilling to commit the political capital necessary to sustain such a policy. Since a possible troop increase was announced in June, journalists and analysts (and Trump’s advisors) have been debating the strategy to which the U.S. should commit itself. However, these debates often consider strategies in isolation, and this is a mistake. Strategies must be judged relative to the realistic alternatives. This article categorizes the most common recent arguments, considers their limitations, and makes an argument for the least bad option, a negotiated settlement with the Taliban. Military engagement without a coherent policy shaping the strategy by which the campaign is carried out is little more than organized slaughter. One potential strategy considers the possibility of a post-World War II arrangement, leaving a permanent contingent of U.S. forces in Afghanistan to keep the Taliban and others at bay and influence other countries with interests in Central Asia. Unsurprisingly, many considering this possibility find the prospect unsustainable and possibly unachievable. Another strategy considers the complex regional dynamics of the situation and suggests increasingly forceful engagement with neighboring countries, specifically Pakistan. Use of Pakistani territory sustains and strengthens Taliban operations in Afghanistan and the Pakistanis have been notoriously difficult partners for the U.S. and others. Still another approach considers the folly of sending more troops before a coherent strategy, or even policy, has been agreed upon. Almost 200 years ago, Clausewitz asserted, “War is a mere continuation of policy by other means.” Military engagement without a coherent policy shaping the strategy by which the campaign is carried out is little more than organized slaughter. A final take on the situation defines victory as an Afghanistan fully restored via so-called nation-building. This argument suggests less reliance on the military and more on civilians and the State Department. Others, like Gary Dempsey, argue the costs so greatly outweigh the benefits that the U.S. should simply cut its losses and withdraw. Withdrawal arguments usually suggest that after ground forces have left the U.S. should send targeted operations into Afghanistan whenever violent non-state actors set up shop again, but this assumes the political will and legal justifications will hold indefinitely––which isn’t a safe assumption. The problem with all of the above arguments is that they only consider one possible form of victory, or take the form of victory as a given. This can be effective when advocating for certain policies, but it also comes with significant limitations. As an alternative, I will present a variety of potential victories––each different in some critical way––and assess the prospects for achieving each and what they mean for U.S. strategy in Afghanistan. What are the prospects for a total victory? It is first necessary to assess the most common assumption for victory and the current state of that possibility. The early stages of the war in Afghanistan were entirely directed at removing the Taliban from power and going after al Qaeda's central structure. This gave Operation Enduring Freedom a specific counterterrorism focus. Therefore, the early objectives necessary for victory were limited: end or degrade al Qaeda and the Taliban. This mission was accomplished, and surprisingly quickly. However, the mission then shifted from counterterrorism to ambitious state-building as the security situation deteriorated and the Taliban began to push back into the country from their sanctuary in Pakistan. NATO troops pushed out from Kabul and sought to extend the new central government’s authority throughout the country. Assuming another military victory over the Taliban could be achieved, the Afghan government would still need to establish control over a territory that few central governments have ever been able to control since modern Afghanistan was founded around 1747. If we assume these more ambitious statebuilding objectives to be the standard by which victory is now measured, each of the following would have to happen before that victory could be considered won: the Taliban would have to be beaten back militarily, the Afghan government would need to establish control over the overwhelming majority of the country, and the U.S. would have no more than a small contingent of trainers and advisors on the ground. Given the length of the effort in Afghanistan thus far, its inconsistent progress, and the present trend, this outcome seems unlikely. Assuming another military victory over the Taliban could be achieved, the Afghan government would still need to establish control over a territory that few central governments have ever been able to control since modern Afghanistan was founded around 1747. Afghan expert Thomas Barfield argues that attempts to extend control over the whole of Afghanistan like other modern states do is a fundamental flaw in U.S. strategy and is simply not possible in a country like Afghanistan. Instead, Barfield has suggested a “Swiss cheese” model should be used. That is, control the vital areas (the population centers) that can be controlled and ignore the areas that cannot. Unfortunately, this isn’t even a realistic model for Afghanistan today, since the holes in government control would undoubtedly be used as safe-havens for any number of armed anti-government and anti-U.S. groups operating in the country. Such a strategy can only work if sustainable and enforceable treaties can be negotiated with the various armed groups. Furthermore, even if the government were able to reestablish control over all its territory, the government has a myriad of high-grade issues that significantly inhibit the its ability to exercise and maintain control and authority over said territory. Corruption inhibits the government’s ability to deliver goods and services. Opium continues to flourish in Afghanistan and fund numerous individuals and organizations beyond the control of the central government, criminal and otherwise. Afghanistan’s relationship with its neighbors is complicated, and contributes to the instability. Afghanistan is also plagued by a persistently weak economy that is unlikely to improve to a sufficient level to contribute to stability or even pay the government's bills without foreign aid. This path to victory also hopes the Afghan government can be encouraged to reform; it cannot. For many non-trivial reasons, it is unreasonable to expect the Afghan government to make the necessary reforms, even if pressured by the U.S. or the international community. Several scholarly articles attempt to explain this phenomenon. Generally speaking, it is clear the interests of the Afghan government will always diverge from those of the U.S. government. Afghan officials will be more interested in crushing coup attempts before they happen or paying off their political rivals; reforming government agencies, especially in the security sector, is more likely to encourage coups and embolden their enemies. No one should hope for government reforms as the path to peace in Afghanistan. In sum, this vision of victory is unrealistic. Too many variables are too unlikely to be achieved for any reasonable person to think that all of them can be achieved, and at a reasonable cost. Can the Taliban be beaten (again) militarily? Taliban defeat on the battlefield is given special consideration here. Some might assume victory over the Taliban today should be as easy as it was in 2001. However, the posture and disposition of the Taliban today is very different than it was in 2001. They have been contesting and controlling territory, and that territory could be retaken if subjected to an effort similar to the one in 2001. However, their underground networks and sanctuary support are much more robust than they were. When pushed back from their territory in 2001, it took the Taliban about five years to build the infrastructure of insurgency and push back into Afghanistan. Today, the Taliban wouldn’t skip a beat if denied their territory. Therefore, all of the issues mentioned in the above section would have to be remedied before the highest possible version of victory could be achieved, and this assumed the Taliban could be defeated anew, which also doesn’t seem likely. A series of unlikely conditions are necessary to sustainably defeat the Taliban. First, total cooperation with Pakistan, who would need to establish control over their own western provinces where these groups are currently afforded safe-haven, would be necessary. Second, Afghanistan would need a robust and functioning security apparatus, which it doesn’t have. Emphasis has been placed on building the Afghan military, but militaries are better at taking and holding territory than they are at defeating insurgencies, which is only step one in a campaign against the Taliban. Furthermore, evidence suggests that terrorist groups are mostly defeated by police and intelligence forces of local governments, not militaries. There is a surprisingly positive trend in the use of Afghan police and intelligence forces to pressure and dismantle the Taliban. Increases in Afghan National Army regular forces have essentially flat-lined. On the other hand, the Afghan government plans to increase the number of special forces commandos exponentially, as shown in the chart below. Commandos have the tools and training to effectively go after non-state actors like the Taliban, but there are still significant barriers to defeating the Taliban via these means. First, the feasibility and effectiveness of doubling the size of commando forces isn’t certain. New recruits are drawn from conventional forces, so current special forces capabilities wouldn’t necessarily be reduced. However, whether they’re able to effectively train, equip, and support such a large force remains to be seen. Second, the Taliban would still be able to launch attacks from Pakistan; Afghanistan would still need to improve policing capabilities; and social and economic conditions would need to improve so unemployed youth couldn’t be convinced or paid to carry out attacks for the Taliban. Furthermore, it is unlikely that the vast increase in commando power will go unnoticed by successive governments. As explained above, corrupt governments tend to weaken their military to hedge against coups. What does a mitigated success look like? With a long list of limitations preventing more ambitious victories, it is important to consider what lesser forms of success might look like and whether they are worth pursuing. A mitigated success would at least contain but not defeat the Taliban and focus on areas of higher strategic value, disregarding areas of lesser strategic value (as in the Barfield Strategy). This version of victory would even allow the Taliban to rule certain areas, or establish a power-sharing agreement in those areas not vital to the Government of Afghanistan. Such an approach could achieve core U.S. national interests at lower costs. For example, this would eliminate Afghanistan as a terrorist safe haven, and if Afghanistan were to revert to a safe haven in the future, the circumstance could be addressed more easily in these circumstances. Furthermore, with no powerful armed group opposing it, the Afghan government would be much less likely to collapse and potentially destabilize Pakistan, which is important for keeping nuclear weapons from proliferating into non-state hands. This strategy would solve one of the weaknesses in Barfield’s strategy by establishing peace with armed groups in exchange for control of their local areas, but how likely is it these armed groups will successfully reintegrate into the legitimate political process? Gulbuddin Hekmatyar, leader of the violent political party Hezb-i-Islami, recently attempted this exact transition. There are also reasons to believe some within the Taliban organization are at least willing to consider what is being offered in negotiations. This is perhaps why the members of ISIS in Afghanistan are mostly disaffected Taliban members. There is no way to know for sure why the former Taliban members defected, but several factors indicate that a willingness to negotiate for peace was important. If the Taliban are to be integrated into the political process, both they and the Afghan people will need to find a path to reconciliation. 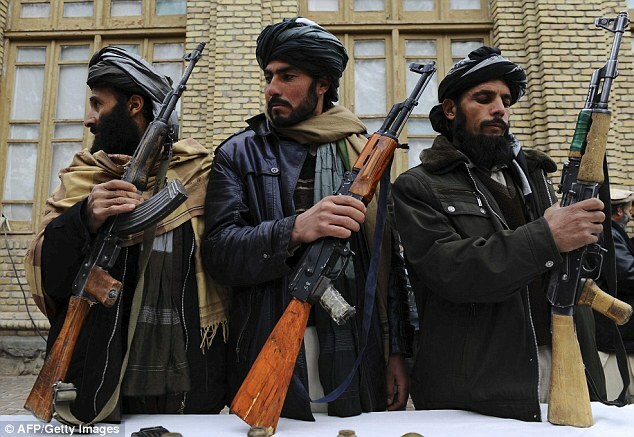 The Taliban have attempted negotiations several times since 2001. Taliban leader Mullah Omar died in April of 2013, but top commanders kept it a secret. Writing under Mullah Omar’s name, these top commanders struck a conciliatory tone, advocating for an inclusive Islamic government in Afghanistan. In October 2014, five to six top commanders of the Taliban defected and subsequently pledged loyalty to ISIS. Predictably, the Taliban command claimed they were expelled from the group. Nine months later, the Taliban called for peace talks again. Therefore it seems reasonable that some attribute the rise of ISIS in Afghanistan to disgruntled former Taliban hardliners, and a willingness to negotiate is a likely source of these sentiments. As is clear by the many failed attempts by the Taliban to negotiate peace, there are limitations to the feasibility of this move for many of the violent groups that forms its ranks. Consider some analogous circumstances. The most powerful violent insurgency group in Colombia, the Revolutionary Armed Forces of Colombia (FARC), recently negotiated a peace deal with the government. Successfully transitioning to peace will be difficult, as many Colombians are still scarred from the violence they carried. Similarly, the Basque Homeland and Liberty (Euskadi Ta Askatasuna or ETA) separatist in Spain is attempting the same move, and the legacy of their violence is also an issue. Likewise, many Afghans remember the part Hekmatyar took in the shelling of Kabul during the civil war following the withdrawal of Soviet forces. Many Afghans will not soon forget the pain suffered at the hands of the various violent groups that fall under the aegis of the Taliban. If the Taliban are to be integrated into the political process, both they and the Afghan people will need to find a path to reconciliation. It is theoretically possible to achieve a deal without this reconciliation, but whatever peace is achieved without it may be tenuous at best. Again, analogy might be useful. Rwanda is engaging in a justice and reconciliation process to deal with the legacies of their genocide. South Africa set up the Truth and Reconciliation Commission to deal with the legacies of apartheid. Alternatively, Indonesia has set up no such commission or process, and their resultant peace has been much more tenuous and fragile. It is also important to consider domestic opinion in the U.S., where the divergence between its interest and that of Afghanistan is perhaps clearest. Even if the Government of Afghanistan could reconcile with the Taliban, precarious as this would be given the support the U.S. must provide to sustain it, any negotiated settlement would be hugely unpopular domestically. Many would see it as surrendering to the enemy, leaving open a cynical but clear political opportunity. The unpopularity of working with the Taliban was on full display when the Obama Administration announced a prisoner swap with the Taliban that retrieved captured U.S. Army Sergeant Bowe Bergdahl. It is unlikely current or future U.S. presidents will be willing to expend the political capital necessary to make a negotiated settlement with the Taliban possible, especially considering the uncertainty of success. Is a mitigated failure worth considering? Considering all of the limitations of the above strategic alternatives, it should be considered what a mitigated failure would look like. A mitigated failure would probably include some or all of the following outcomes. First, traditionally Pashtun lands would be conceded to the Taliban, and the central government would maintain a tenuous control over other territories. The Taliban are strongest in Pashtun regions, but they have shown an ability to reach beyond these areas. Regions under strong Taliban control would be relatively peaceful, but fighting would remain intense in disputed areas. Pakistan would be keen to avoid this, much like the Turks wanting to resist an independent Kurdish state. Pakistan’s position in Afghanistan has always been to maintain as much influence over their neighbor as possible. Prior to 9/11, the intelligence and military establishment in Pakistan had established close ties with Mullah Omar and the Taliban. However, Pakistan post 9/11 has been forced to align reluctantly against the Taliban. The Taliban now has bases of operation in Pakistan and it is not certain that a peaceful relationship could be established if they gain some control in Afghanistan at the expense of the government. The possibility of the Taliban gaining power in Afghanistan and looking for more influence east of the Durand Line is too great a risk. What does abject failure look like, and how is it avoided? That leaves one final possibility: abject failure. This could happen if the international community loses patience with Afghanistan and cuts its losses, like the Trump Administration is perhaps considering. This certainly wouldn’t be the first time Afghanistan has been cut loose; there has been a pattern of countless such abandonments throughout history, like the Soviet withdrawal in 1989. Importantly, though, the international community has always decided to return. Afghanistan’s strategic importance to the rest of the world is significant, and modern forms of terrorism have compounded the effects of this strategic importance. This significance is evident in the many times that multiple empires have attempted to conquer it. Afghanistan is at the crossroads of the Middle East, Southern Asia, and Central Asia, and it continues to be a vital transit area for land-based commerce and gas and oil pipelines. There is no doubt that cutting strategic losses today might result in a strategic need to return a few decades, or even a few years, later. Previous attempts to define victory in Afghanistan, and therefore advocate a strategy, have often considered various types of victory in isolation. However, the ideal end state for Afghanistan should be considered relative to the alternatives. A total victory is ideal, but needs to solve numerous enormous problems resulting from seemingly endless systemic conflicts. It would also require the greatest degree of political will sustained over the long-term. Furthermore, it is unlikely that the Taliban can be beaten militarily like they were in 2001. The government of Afghanistan and its allies could regain lost territory, but it is already a robust insurgency and terrorist organization; and these types of movements are rarely defeated militarily. Abject failure would be cost efficient in the short-term, but the resultant problems would increase costs over the long-term and would undermine U.S. national interests. A mitigated failure would likely have all the negative costs of abject failure, but with greater U.S. losses on the path to failure. Ultimately, total victory is ideal but highly unlikely. Abject and mitigated failures have long-term costs and endanger U.S. national interests. This leaves us with mitigated success and a negotiated settlement with the Taliban as the most prudent option. A negotiated settlement would come with high political costs to whichever U.S. president decided to pursue it. However, these political costs would be lower than those required for a total victory. Furthermore, negotiations have mostly failed because there is no concerted effort or strategy to achieve it, just periodic opportunism. There’s no doubt this strategy would be highly unpopular and downright offensive to many Americans––especially veterans of the war. However, the question shouldn’t only be about its popularity; it should also be about its feasibility to bring about the end of America’s longest war. The path of least resistance in Afghanistan is to contain the Taliban over the long-term. This starts with a continued focus on the building of commando and police capacity while reducing resources for the conventional Afghan National Army, because the Taliban are the problem rather than external invasion. The maintenance of a strategic alliance with the government of Afghanistan to deter foreign military interventions will allow the central government to focus on internal state building and reconciliation. The encouragement of smaller insurgent groups to negotiate transitions into the political process will enable reconciliation. Finally, seeking avenues to allow for a negotiated settlement with the Taliban, and integration into the political process if necessary, are critical. The other victories mentioned above are certainly possible, but not at acceptable costs. A total victory––while appealing––would require extensive resources, in both blood and treasure, expended over an indeterminate amount of time. In 2012, a majority of Americans wanted to speed up the pace of the 2014 withdrawal. When the war started in 2001, about 90% of Americans said starting the war was not a mistake. Today, that number has decreased by about 40 points. No politician will have the political capital to commit the resources to a total victory. Other types of victories are more ideal and would be more popular, and despite the sentiment against the option, a negotiated settlement is not only more likely to happen in our lifetime, it’s also the most feasible outcome for success. Adam Wunische is a U.S. Army veteran who has deployed twice to Afghanistan. He is also a PhD student at Boston College and a contributing analyst at Wikistrat.